The Samoyed takes its name from the Samoyedic people of Siberia. 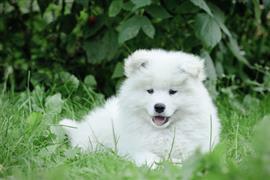 A few unique dog names borrowed from groups of Samoyedic people include Selkup, Mator, and Koibal. The breed has a dense double coat that is an adaptation to the cold region from which it comes. A few climate-related names include Powder, Tundra, Polar, and Freeze. Most people identify the Samoyed by its fluffy white coat. Many of the more popular names among the breed are related to this dignifying characteristic. Cotton, Bianco, Casper, and Sugar are a few owner favorites. Smiley and Sammy are top choices that are also common nicknames for the breed. Interesting names can be found just about anywhere. Bronx, Brooklyn, and Staten are ideas coming from boroughs of New York. Some of our pages will contain a subcategory. A subcategory is a slightly more specific grouping than the main topic of the page. For a subcategory, we will include a separated table of names and corresponding descriptions. An example of a subcategory of Red Dog Names would be 'Dog Names Inspired by Red Wines'. If you have any subcategory ideas for the Samoyed Names page, we would love to hear them. Use the form below to submit your ideas.